Yesterday, Arrow star Stephen Amell posted to his Facebook page, teasing a mind-blowing reveal at the end of tonight's episode of the hit CW superhero series. Could it be another fan-favorite DC Comics personality added to the mix? Writer and executive producer Marc Guggenheim took to Twitter earlier today to inform Batwoman writer Marc Andreyko that Kate Spencer--a character Andreyko created for DC Comics--will be appearing on tonight's episode of Arrow. Andreyko's Manhunter has been arguably the defining work in his career up to this point, and he's made no secret he'd like to see Kate Spencer return to DC Comics; she hasn't been seen since the New 52 relaunch. In the first season of Arrow, Kate Spencer appeared, played by Chelah Horsdal after Birds of Prey star Ashley Scott either didn't sign on, or didn't get the job (she tweeted about reading for the part). She was to be the prosecutor had the case against Oliver Queen (he was being accused of being the vigilante) gone to trial, but it did not and she appeared only once, in the episode titled "Damaged." Tonight's episode, "State v. Queen," sees Oliver's mother Moira on trial for her role in the deaths of hundreds of Starling City citizens during the manufactured earthquake that Malcolm Merlyn engineered in the season one finale. In the comics, Kate Spencer was a district attorney who, tired of seeing super-powered killers get off on insanity pleas, stole a bunch of superhero tech from an evidence locker and became Manhunter, taking to the streets to dispense deadly justice. 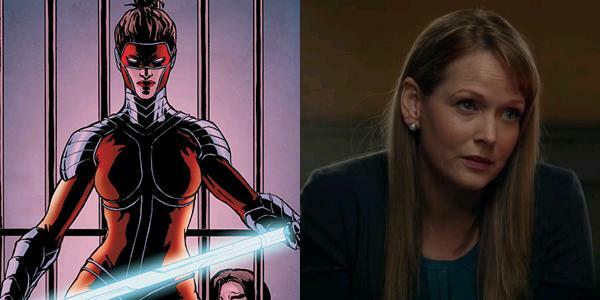 Whether we'll see a Kate Spencer who more closely reflects that type of character, whether Horsdal will return or be recast...these questions are as yet un-answered, but it's worth noting that Manhunter was briefly a member of the Birds of Prey after her own title was cancelled--and showrunners have hinted that when Black Canary returns, the Birds of Prey may not be far behind.